Both the print and ebook version of this issue will be available for sale on Amazon starting August 24th. We will be present at campus events with a limited number of copies to purchase, so your best bet will be to purchase online and have the issue shipped directly to you. Remember, you can get free 2 day shipping if you have Amazon Prime, and if you don’t they are always offering a 30 day trial. As always, all of our ebook issues will be available as a FREE download the first week of release, August 24th to August 28th, so be sure to grab any you don’t have as well as the new release. Ebook will be $4.99 as always. Print will be $22.00. All proceeds go toward printing future issues. We are a non-profit student run and self funded organization. Spring 2015 Issue is Available! 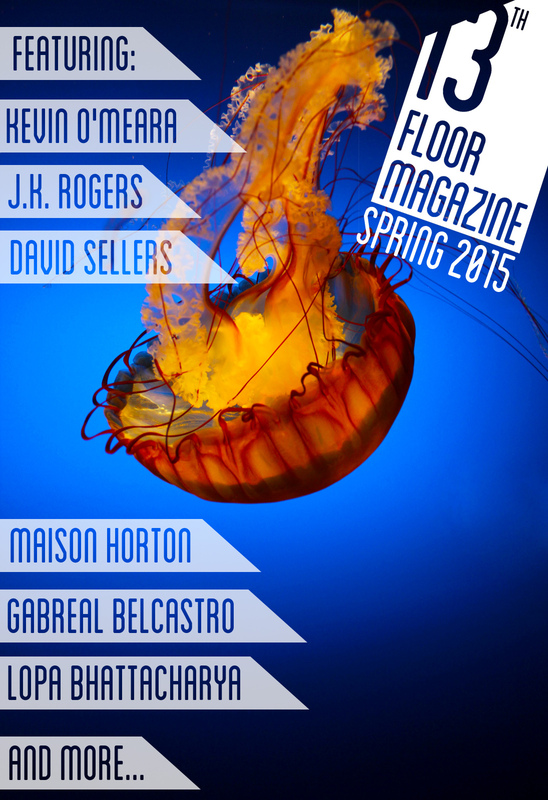 We are very excited to announce that our Spring 2015 issue is now available! You can download it for free through Amazon.com from now until Friday, January 16th at midnight. In addition, our previous issues are also for free until the 16th. After that, they will be $4.99 each, so get them now! All of our issues can be viewed on your Kindle, smartphone, desktop, or tablet. This new issue is particularly exciting because there is a wonderful blend of original, creative written work and unique, visual art. Our contributors submitted their best, most publishable work, and we were thrilled about the variety of talent that we received. That being said, we are already looking forward to what is to come for our Fall 2015 issue. So if you were unable to submit your work last time, we are now accepting submissions. Please send us your original written or visual work of fiction, photography, non-fiction, drawings, poetry, sculpture, etc. If you’ve never sent your work to 13th Floor Magazine before, our submission guidelines are listed below. A fresh issue filled with local talent is a great way to begin a new year and a new semester. Do not put your name in the document. Do not put your name in the filename. Please use only the title of your work in the filename. This is very important to us as we want to maintain a fair and unbiased selection process for each of our submissions. In the body of your e-mail, please include a brief biography. You can write whatever you’d like, but feel free visit our Meet the Staff page if you need some ideas. If your submission is chosen for publication, your biography will be included in the magazine as well. Remember, the biography needs to be in the body of your e-mail, NOT your submitted work. For visual art, sent us pictures of your artwork. If there is any special information about the art, like the medium, influences, etc., feel free to include that as well. All prose and poetry should be double spaced and in standard fonts Times New Roman or Arial. Be sure to thoroughly edit your work for spelling and grammar errors so you can represent your best work possible. If you need editing assistance, don’t hesitate to use campus services like the Writing Center. If you would like more tips on professionally formatting your document, please read Formatting 101 by Marlys Pearson. Once you have professionally prepared your submission, e-mail it to 13thfloormagazine@gmail.com Remember, include your biography in your e-mail!